Peter was on the run. He had just shot to kill, but then something had gone terribly wrong. Instead of the promising thud of a wounded deer going to the ground – promising that is, to feed his family -- he heard the shouts and barks from the valley coming towards him. Then he heard the first shots -- not aimed at deer, but aimed at him. Peter ran as fast as he could. However fast he might run, though, he knew the only possible way to safety -- the only thinkable escape route -- was the one that was blocked by his pursuers: back down to the safety of the valley! So up he had to go. Above him, though, there were several hundred feet of seemingly impenetrable rock, and nothing else. He knew he had to try, for his wife and the kids. And try for his own sake as well, which, strangely enough, was the least of his concerns. He shouldered his gun, took a deep breath and started the ascent. Against all odds, Peter was about to attempt the impossible. The higher he went, the steeper it got. Peter pushed himself forward. Still, his hunters seemed strapped to his heels. He had hoped the shouts, the barks, the shots and all the other terrifying noises would diminish the further up he got, but he was still far from outrunning them. And there was still this bare wall of repulsing rock looming for hundreds and hundreds of feet. His pursuers were confident that they would catch Peter, the infamous poacher; there was no way, they assumed, for him to escape. In the meantime, Peter reached the rocky regions of the mountain flank and started to scramble, struggle, and climb his way up. The terrain was tough, but doable. Then suddenly, with his pursuers falling a bit behind and his arms getting increasingly worn out, Peter was confronted with the toughest piece of rock he could imagine. With courage stemming from despair, he hooked his hands in a cleft and took a courageous step over the void to the relative safety of a rocky bluff. He could not believe he had done this. Never before had anyone gone that far up the mountain! In a way, it felt as if he was already at its top. Indeed, the rest of the way was fairly easy to navigate. Faster than he thought he reached the ridge. Below him, he heard the hunters’ noises almost as a distant memory of dangers he had managed to escape. With the increasingly frustrated noises fading away, Peter ran down the benign mountain slopes to the south, back to his village, his wife and his kids. He was tired, torn and hungry, but alive and free. 19th century, discover the “path” and used it throughout his life as a convenient escape route. Even today, standing in front of the Gesäuse mountain range and looking over the forbidding walls is truly impressive - and an escape path is nowhere to be seen. If you make your way up you will see that the route is simply brilliant and - breathtaking. It cleverly uses the “weak areas” of the rocks, culminates in one spot more difficult and daring than the rest of the trek - the so-called Ennstaler Schritt - and finally leads you through rocky slopes up to a col below the range’s highest peak, the Hochtor (2369m or 7772 ft). The route is surprisingly easy, but not for beginners or the less-experienced. It requires climbing, not hiking. The “official” grade of difficulty, according to the UIAA scale, has been assessed with II. So it’s not a simple Sunday afternoon stroll and should only be attempted by experienced mountaineers or with the help of a professional guide. At the col, you can either continue up to the Hochtor summit (via Dachlgrat –- a bit more demanding than Peternpfad itself) or follow an easy hike to the Hess-Hütte. Owned by the Austrian Alpine Society, it is operated by a tenant who has been there for ages and took over the hut’s operation from his aunt. In any case, it is worthwhile to stay for the night at Hess-Hütte as the unique mountain environment easily charms any outdoors enthusiast. There also are less demanding, but equally beautiful, ways to reach Hess- Hütte. The easiest starts from a village called Johnsbach and takes some three hours of ascent. Johnsbach also is the site of a well-known mountaineers’ cemetery. It is worth a visit as it marks the final resting place of many of the region’s legendary mountain-pioneers and allows for a journey into the history of mountaineering. (For more information on Johnsbach, check out www.bergsteigerdoerfer.at and click the link for Johnsbach). Since 2003 the Gesäuse Mountain Range is protected as National Park; for more information, check: http://www.nationalpark.co.at. A twenty-minute car ride through the Gesäuse valley -– or Xeis as the locals call it, mocking the fizzling sound of the water thundering through the Canyon -– will bring you to one of Austria’s best known marvels of baroque monastic achievement: the Benedictine Abbey of Admont. Founded in 1074 in an area described as “ad montes”, i.e. “close to the mountains”, the Abbey had perhaps its strongest time during the baroque era. Today, it houses what is believed to be the largest monastic library in the world. The library is home to some 200,000 volumes and other treasures such as incunabula (books printed before 1500) and manuscripts dating back as early as the 8th century. It also is itself a work of art, combining the finest of baroque architecture, sculpture, painting and interior design. 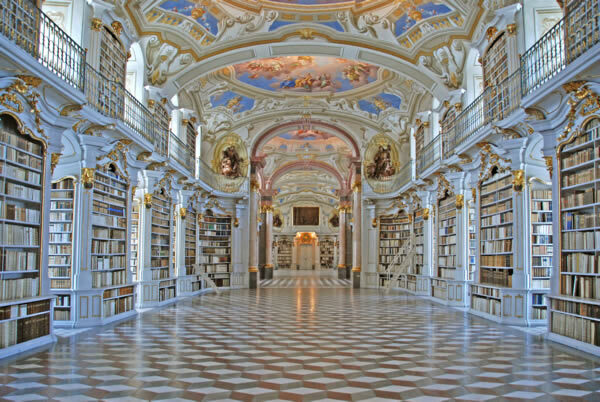 No visit of the region is complete without the abbey and its library (check out: http://www.stiftadmont.at/english). For those in search of a different type of spiritual experience, Admont also offers an herbal concoction based on ancient monastic knowledge: the Admonter Kräuterlikör. Its exact recipe is known only to a chosen few. As it is widely regarded as a medication rather than a drink, you can also buy it in the Abbey’s own pharmacy. Markus Reiterer is the Political Counselor at the Embassy of Austria, Washington, D.C.